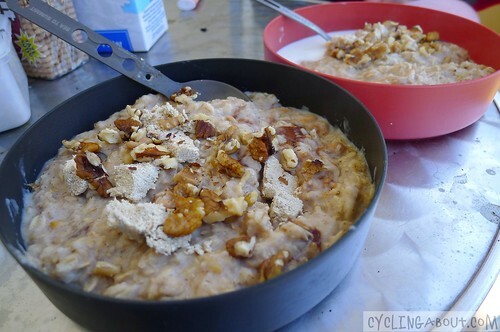 Porridge Breakfast: A Cyclists Best Start to the Day! They say that breakfast is the most important meal of the day. I tend to agree! Food is the fuel and energy for our bodies. Without food we spend the day stumbling around and fighting off headaches and grumpy attitudes. Breakfast is literally breaking the fast that your body is in from the night before. Breakfast does all kinds of marvellous things to us including boosting our energy, increasing our attention span and heightening our sense of well being (mood). Breakfast also lifts your blood sugar level from their daily low (when you wake up), consequently feeding your brain with the food it likes most, glucose. My favourite time of the day is, without doubt – breakfast time! This is my time to wake up slowly, warm up, fuel my body and allow caffeine to enter the system. You can often find me talking about how good breakfast is going to be – at 5pm the night before! You won’t ever find me rushing my breakfast either. I try to get up early enough to digest my food properly. A big healthy breakfast gets you ready for the day. It feeds your brain the important nutrients to start the day off right. It revs up your metabolism for the day, allowing any food to be consumed more efficiently later on. The most ideal way to eat is with breakfast and lunch as your biggest meals, as this is when you are most active. It is not as healthy to have a late, heavy dinner which forces your stomach to digest food at night. Stomachs need rest too! 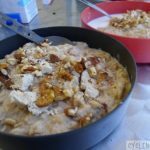 A breakfast with a low glycemic index and load (such as porridge, nuts and apples) will allow you to burn your food slower and more efficiently on the bike. It allows you to get a good ride in before lunch, as you won’t have to stop and eat as regularly. High fibre, whole grain breakfasts are well-recommended. High-fibre foods include fruits, vegetables and whole grains. I’ve always been an avid porridge eater. I can’t have enough of the stuff! The best thing is that the regions I tour through often dictate the flavour of my porridge, as not all ingredients are found everywhere. Sweeteners: Apple sauce, halva, dark chocolate, cocoa powder, and sugar (vanilla, regular or raw). 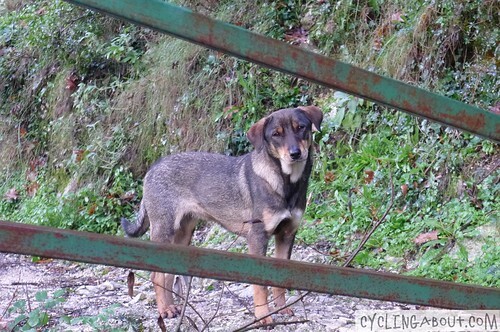 An Albanian dog hoping for a taste of my famous porridge… not likely! I cook with rice or barley when oats are not able to be sourced. It isn’t my preferred breakfast for two reasons: I don’t find it as tasty, and; it takes longer to cook. 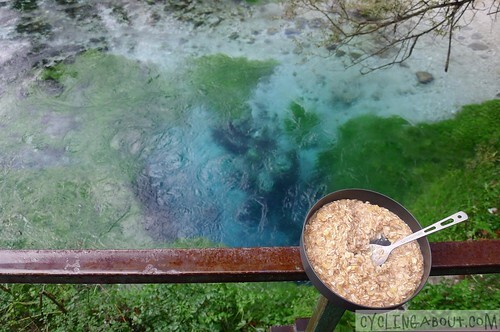 To make a rice porridge, I generally cook my rice using the absorption method. Once the rice has cooked through, I over-cook it roughly for 10 mins, adding extra hot water and soy milk to the mix. Once the rice is a porridge consistency, I add whatever extras I like and let it sit. You can pre-cook the rice the night before if you’re short on time in the mornings. 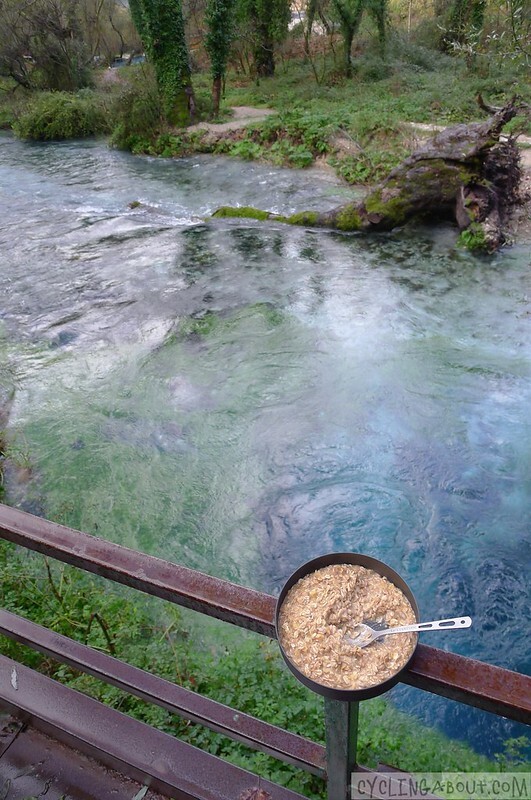 Breakfast at the Blue Eye Spring in Albania – perfect! Have You Got Any Other Porridge Tips or Ingredients?